Chocolate is a raw or processed food produced from the seed of the tropical Theobroma cacao tree. 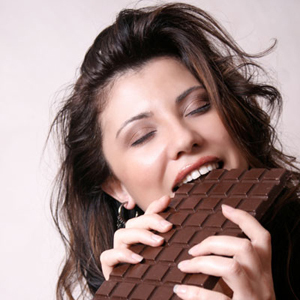 We love to eat chocolate, but we think that it will cause high cholesterol levels as well as obesity. Even though chocolate is regularly eaten for pleasure, there are potentially many health effects, both negative and positive. 1. Scientists have found that people who eat chocolate have a 37% lower risk of getting cardiovascular diseases. This is only true for dark chocolates and people should only eat one a day. 2. People who eat chocolate may also have a lower risk of getting diabetes by 31%. 3. There is also a 29% chance of having fewer strokes when eating dark chocolate. The food item lowers the blood pressure which is a major source of strokes and heart attacks. 4. You can still eat chocolates and not gain substantial weight. You can for example eat lighter lunches which cause you to consume 250 calories less. 5. It stimulates endorphin production which gives you pleasure at the same time. 6. Chocolate does have serotonin. Serotonin is a natural anti-depressant. If you are under stress and worried, go for one chocolate bar. Do not overdo it! 7. It is delicious. It fills your stomach. If you do eat a chocolate balance it with something good and something that is nutritional without sugar or exercise. 8. Stress relief! As it lowers your blood pressure, it relieves the stress that brought you to the boiling point of eating. Remember do not eat too much. 9. It is a friend when you run out of ideas on presents. Having and bringing chocolate is always thankful. Do not have a habit of bringing a box of chocolates every time as you may find yourself becoming cheap. 10. Stimulants are present. Many chocolates have caffeine inside. Having one bar of chocolate could keep you up for studying or school purposes.